Pentatone makes a point of declaring its sound reproduction to be of very high quality. Indeed, it is, as this Super Audio Compact Disc certainly attests. Put simply, you hear everything very clearly and very realistically. Thus you get a highly accurate account of what the performances sound like, apparently with very little tinkering in the balances by sound engineers. On the whole, the interpretations here by Armenian-born Nareh Arghamanyan (b. 1989) are sensitive and reasonably well thought out. She's won several first prizes in major competitions including the 2008 Montreal International Music Competition. She is obviously a very talented pianist – talented but not quite fully developed yet, as the sound she produces on the piano needs a little more heft and muscularity in places: fortes often aren't potent enough to hear above the orchestra. 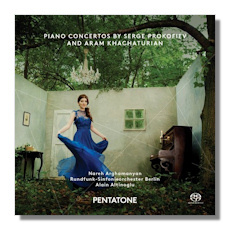 When Arghamanyan first enters in the opening movement of the Prokofiev Third playing the lively main theme, too many of her notes are barely audible: for example, where are the trills that come right at the end of the first movement main theme? You only vaguely hear them, and why are the glissandos leading to the climactic statement of the march theme so feeble? Even her mezzo-fortes and softer notes are often a bit lacking. Still, this is a reasonably convincing account of the Prokofiev Third. The finale is well played: the big theme in the middle section is beautifully and sensitively rendered and the ending is quite exciting. Too bad this more aggressive kind of playing isn't more in evidence throughout the rest of the concerto. There are better recordings of this popular work by Byron Janis, Van Cliburn, Martha Argerich (with Dutoit), Lang Lang, and others. The Khachaturian Piano Concerto fares better, especially in the cadenzas, where the pianist delivers very sensitive and insightful interpretations. The very first cadenza in the first movement is played with haunting and subtle tones, for once making this music sound colorful and quite arresting. The second cadenza is thrilling and energetic early on and very dramatic, almost sinister in its deft phrasing in the latter half. The second movement is paced just about perfectly and its exoticisms emerge so subtly, both from the pianist and orchestra. The flexatone is replaced by a musical saw in this performance and it is mixed into the sound fabric in proper proportion, not overwhelmingly as in several other recordings that employ a flexatone. When the main theme comes back at the climax, it is played by pianist and orchestra with energy and a sense of both triumph and celebration. The finale has a subtle, sort of playful quality, thanks to the pianist's often bouncy, staccato-like style. This is the hardest movement to bring off owing to the music's threadbare character: there's not much substance to the main theme really – a sort of spastic rhythmic morsel that expands upward briefly and then downward. And too, the finale's ending is rather bombastic. The cadenza – again played imaginatively here – may be the movement's strongest point. This is an excellent performance of the Khachaturian that can stand with the finest competition, which includes versions by Antonín Jemelik, Mindru Katz, Dickran Atamian and Constantine Orbelian. In both concertos Alain Altinoglu draws fine performances from the Rundfunk-Sinfonieorchester Berlin. So there you have it – a good though not great Prokofiev Third, but an excellent Khachaturian.